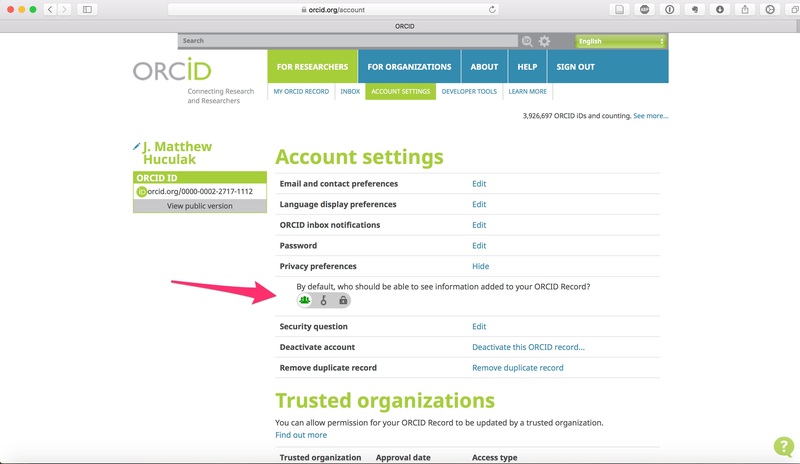 The purpose of ORCiD is to share your work. But, you may want to limit accessibility if you are creating your page, or if you have other reasons. You can limit who can see your material as a whole or on an item by item basis. To limit who can see your entire profile, go to "Account" settings and scroll down to the Privacy section. The icon on the left means that my profile is visible to everyone. The "key" icon in the middle means that only people who I have authorized can see my profile. The "lock" icon means that only I can see my profile.